InSPAration Spa Fragrance 1/2 oz. 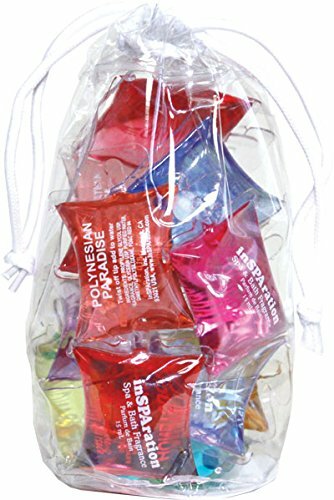 Sample Pillow Packets in a Gift Bag! Directions: For Spas and Hot Tubs add 1 packet for every 500gal. For Baths add 1 packet. inSPAration, the leading aromatherapy fragrance, for Spas, Hot Tubs and Whirlpool Baths has been manufacturing fragrances for over 30 years. Their unique aromatherapy blends are formulated for your hot water enjoyment, creating a rich soothing "Aromatherapy Experience." inSPAration's large variety of fragrances and fragrance blends create that ultimate spa experience while at the same time leaving your skin soft and moisturized. inSPAration Liquids and Crystals are all RX Enhanced. Natural Aloe Vera Extracts and Vitamins E & C have been added to the proprietary blend. Tested by Dupont, Aristech and other leading acrylic manufacturers, inSPAration is proven to be safe for all Spa, Hot Tub and Whirlpool Bath surfaces. Ideal for masking those unwanted chemical odors without foaming, affecting PH Level, or water chemistry. Formulated specially for jetted systems whether for Spas, Hot Tubs, or Hydrotherapy Tubs, inSPAration has been proven safe for all motors, jets and acrylics. inSPAration contains no alcohol and is water-soluble. inSPAration's custom blended Fragrances come packaged in 9oz. Bottles, 1/2oz.single-use Pillow Packets, Spa Crystals, Sampler Bags and many different kinds of Gift Packages. With over 50 Fabulous Blends there are scents for every different occasion. If you have any questions about this product by InSPAration, contact us by completing and submitting the form below. If you are looking for a specif part number, please include it with your message.